One of the first rock stars, Jimmy Liggins established much of the formula for success in the rock world as it was taking shape. His songs were raucous celebrations of life on the edge featuring wild tenor sax interludes conveying a constant feeling of propulsion. Liggins was the younger brother of bandleader Joe Liggins, whose pre-rock style of music was far more refined, though not without its own influence on the music over the horizon. After working as Joe’s chauffeur Jimmy started his own band and immediately made his mark by scoring four hits on Cash Box’s territorial charts in his – and rock’s – first full year. Though possessed of a nasal baritone, a somewhat limited vocal delivery and often recycled melodies, Liggins’s songs nonetheless perfectly epitomized the thematic and musical freedom of rock ‘n’ roll. His lyrics spoke to the restless ambition of his generation and his attitude was decidedly forward thinking in its brash optimism. While his own solid electric guitar was only occasionally highlighted over the years, his first band The Drops Of Joy featured the dual saxophones of Charlie Ferguson and Harold Land whom he turned loose at every opportunity, helping to establish the excitement inherent in the music from the start. In April 1949 while still at the peak of his popularity Liggins was shot through the mouth on stage causing extensive damage to his jaw, teeth and tongue. Though he survived he was out of the recording studio for more than a year and after his return – despite some strong records – he couldn’t quite reclaim his stature, at least consistently, as he scored just one additional national hit, ironically with what would become his signature song, “Drunk”, in 1953. Like many other first generation rockers Liggins faded into history as the audience rapidly expanded mid-decade, recording with diminishing returns for successively smaller labels. In the 1960’s and 70’s he operated his own record label with no notable success, and later opened a music school to pass along a lifetime a wisdom gained in the industry. 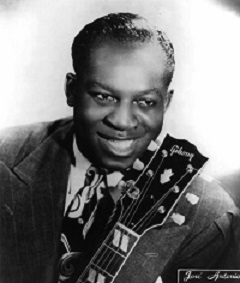 Liggins died in 1983 at the age of 60 and other than some posthumous recognition for his “Cadillac Boogie” as it related to a later more acclaimed song (Jackie Brenston’s “Rocket 88” which stole shamelessly from it), his role in the birth of rock has been largely forgotten.